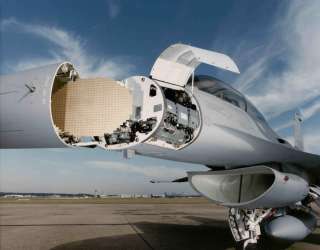 The AN/APG-68 is an X-Band pulse-Doppler radar for fighter aircrafts. It occupies a volume of less than 0.13 cubic metre (4.6 cubic feet), weighs less than 164 kg (362 pounds), and requires an input power of 5.6 kilowatts. The AN/APG-68 Radar System is used on the F-16 C/D aircraft. The AN/APG-68 is an evolution of the AN/APG-66 with increased range, more modes and better resolution compared to the APG-66 radar. Both radars use a mechanically steared beam. AN/APG-68 can search 120 degrees in azimuth and elevation and is supposed to have a range of 35 NM (≙ 65 km) in the “look-up” mode and 27.5 NM (≙ 50 km) in the “look-down” mode. The APG-68(V)9 radar has a 30% greater air-to-air detection range (i.e. : 85 km), and a synthetic aperture radar (SAR) mode for high-resolution mapping and target detection and recognition.